The document is of a July 10th 1972 strategic government and security meeting at Stormont Castle involving the Secretary for State William Whitelaw MP, the North’s most senior British Army officer the General Officer Commanding (GOC) General Ford, Deputy Chief Constable of the RUC, Lord Windlesham the British government’s representative in the House of Lords, British MP’s, and senior civil servants from the NIO and London concerning the aftermath of the braking down of the IRA truce. (3) That the British government would publicly blame the IRA for the ending of the truce. The shooting dead of a Catholic Priest and 5 civilians in west Belfast by the British Army the day before the meeting are also mentioned. ‘Of the approximate 300 hundreds killings by the British Army there has only been convictions in three cases. All of those convicted were released significantly early and reinstated back to their regiments. Some were promoted. The processes of investigation into these hundreds of killings were perfunctory whereby a situation of de facto impunity existed. The discovery of this document indemnifying British soldiers from the threat of court proceedings whilst they took their ‘war’ to nationalist communities with the ‘utmost vigour’ is the first official documented evidence of a policy amounting to impunity. It is a clear amnesty being put in place for what would later occur, the inevitable loss of life. In 1972 the British Army killed 79 people. Not one soldier was held to account for these killings. ‘This document provides an important insight into the mindset of the British government and those directly involved in and responsible for ‘security’ and its policy development. A policy that went onto have disastrous consequences for our entire community. Many observers will view this document as sectarian in its outlook and strategic approach. ‘Despite their involvement in sectarian murders the UDA were not a proscribed organization. They were permitted to patrol areas and exist alongside the RUC and British Army at a time when intelligence would have clearly shown the UDA to be involved in sectarian murders. In the minutes of the meeting the GOC praises the vigilante efforts of the UDA. Loyalists killed 27 Catholics in July 1972. The UDA were responsible for at least 16 of these killing. In 1972 loyalists killed 121 people of which the UDA were responsible for approximately 80. ‘Of course this was to target nationalist and republican areas. Evidence shows that when the British Army went on shooting and killing sprees, loyalists simultaneously carried out murderous attacks. 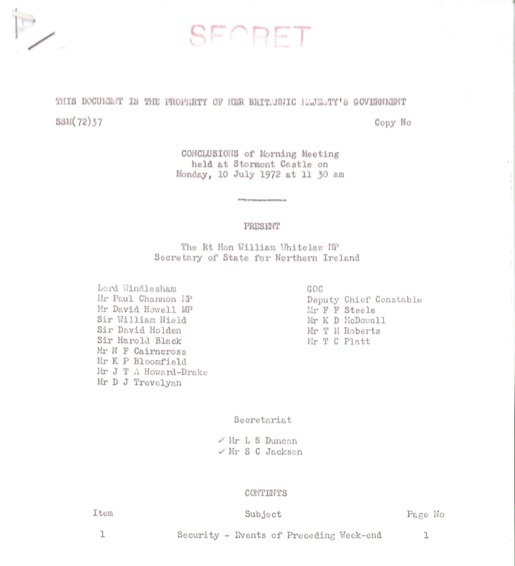 ‘In July 1972 the British army killed 20 unarmed Catholics, 14 of whom were killed in days following the meeting from which this document emerges. Many more citizens were shot and injured. ‘The questions that the bereaved families, and the injured, now ask is; Was that ‘utmost vigour’ a license to kill their loved ones with impunity? ‘The clear answer to this question can be found in the strategic policy position outlined in this document when it states; ‘The (British) Army should not be inhibited in its campaign by the threat of court proceedings and should therefore be suitably indemnified.’ This equates to an amnesty – state killing with state sanctioned impunity. This is illegal and in direct violation of the British government’s obligations under the ECHR and other international treaties protecting human rights and the right to life. ‘Consequently, and corresponding with the document, there were no prosecutions of British soldiers concerning this spate of killings and injuries. These killings, like hundreds of state killings, have never been properly or independently investigated. ‘The rate of shootings by the British Army on the ground in this period correlates precisely with this document of war. The planned aggression was against the civilian population by the British government in which orders from the top went down the chain of command and led directly to the killing of 14 unarmed citizens in the days afterwards. ‘That those orders were in the context of an ‘indemnity’ from the threat of court proceedings must have also been communicated to British Army officers in charge of those responsible for these killings. ‘All right thinking people must challenge this impunity. The British government must now respond to this document and address the matter with the utmost vigour in delivering justice to the bereaved families. ‘Relatives for Justice work with and support many of the families bereaved as a consequence of the horrendous outworking of this document. The document has now been provided to families and their lawyers. It is the intention of families to seek to address its content in respect of killings by the British Army and the failure to hold to account in any way those responsible. The position regarding the relationship between the authorities and loyalists is also of concern and families bereaved in these circumstances at this time too will also seek legal advice. ‘The document comes in the aftermath of a recent University of Ulster (UUJ) report that highlighted investigative bias in examining British Army killings during this period by the current PSNI’s Historical Enquiries Team (HET). At the time of these killings an arrangement existed between the RUC and the British Army that the Royal Military Police (RMP), and not the RUC, would conduct investigations into fatal shootings by the British Army. This arrangement covered the period from 1970 until September 1973 in which the British Army killed over 150 civilians including women and children. The matter of indemnifying British soldiers must also been seen in this pre-existing policy arrangement. Please accredit discovery and publicising of the document to Relatives for Justice. The day following this meeting in July 1972 16 year-old Gerard Gibson was shot-dead by the British Army. In the 21 days immediately after this Stormont Castle meeting, July 10th until July 31st, the British army killed 14 people. This does not include those killed by the British Army from July 1st until 10th, which included the Springhill Massacre of July 9th that claimed the lives of four civilians, three of whom were children, and a Catholic priest administering to those killed and injured, and another Catholic civilian shot whilst driving his car on the Falls Rd also on July 9th, totaling 20 murders by the British Army that month. Loyalists were also responsible for 8 murders from July 1st until the July 10th Stormont Castle meeting, and a further 19 murders from July 11th until the end of the month totaling 27 murders. The UDA were responsible for the vast majority of these murders. In 1972 the British Army killed 79 citizens. Loyalists killed 121 citizens.